Listened to an interesting piece this morning on NPR. It was about a new book (A More Perfect Heaven) about Copernicus and the publication of his On the Revolutions of the Heavenly Spheres. Apparently he waited several years to publish this work because of the controversy it raised in claiming that the earth was not the center of the universe. The reporter said that people at the time all knew the sun, stars, and planets revolved around the earth. Here is the part that got my attention, “and the Bible said so,” she reported. I never knew the Bible said that the sun, stars, and planets all revolved around the earth. Did you? We do not read the Bible this way because we live more than 500 years later. The earth revolving around the sun is not a controversy for us, so we do not read the Bible as though it claims the sun revolves around the earth. At Austin Avenue United Methodist Church’s Fall Festival, a couple of college seniors asked about this Fallout Shelter sign. 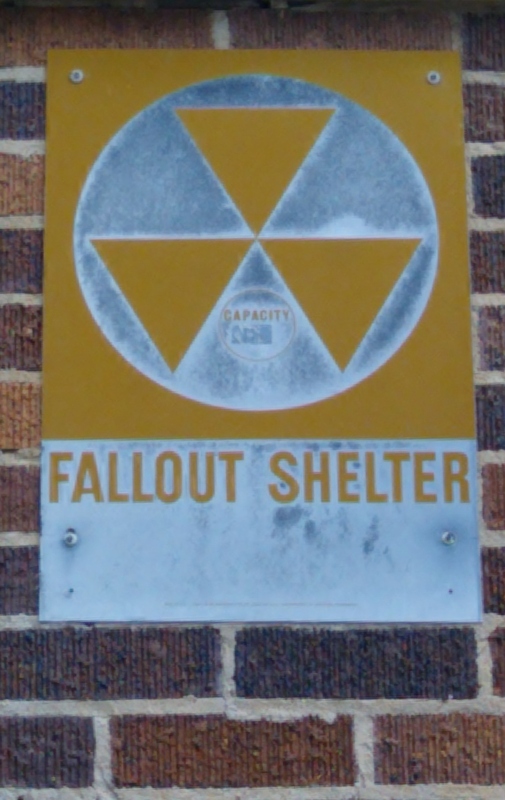 Not only did they not know what it meant for the church building to be a fallout shelter, they had no concept of what a fallout shelter was. As much as this surprised everyone over 30, there is something happy about younger people not having to know what a fallout shelter was (is). It is not part of their world, so they don’t need to know. Much like the way we read the Bible, we read “signs of the times” depending on the culture we grow up in. Some things about the way others read, or the knowledge or background others bring to interpret signs astound us. I cannot help but wonder what kinds of things you and I take for granted will be looked back on 20, 40, 100 years from now with this same perspective. Just found this great post by Tyler Bradt at We Are Informed on sustainability and the meat industry. Notice that neither Tyler nor I are calling you to vegetarianism! In case you haven’t been keeping up, Texas State Troopers and DFPS raided a compound in Eldorado earlier this month upon the threat of child sexual abuse. The Compound, known by those who live there as the YFZ or Yearning for Zion Ranch, belongs to a group identifying themselves as Fundamentalist Latter-Day Saints, or FLDS. The FLDS is a group known mostly for polygamy. Our local paper, the Waco Tribune-Herald, carried an article last week about polygamy, and how common it is. Most polygamists fly well under the radar, don’t group themselves into compounds, and according to the article, lead relatively “normal” lives. Rather than discussing what a “normal” life looks like, I’d like to take this a different direction. What if some people are predisposed toward polygamy? If polygamy were legalized, and thus regulated, would the state have a better method of limiting abuse in such families? Only half my tongue is my my cheek as I ask these questions. I’m not bragging; it is a bitter pill to swallow. I am, nevertheless, The Man. Mid 40’s, white, college educated, American male-that’s exactly who I am. This is a discomforting realization for a guy who always saw himself as counter-culture, anti-establishment. How can it be that “Fight the Power” and “Stick it to the Man!” are some of my favorite things to say? Have we, the “outside world,” proven them wrong? Is this a self-fulfilling prophecy? I don’t think they’ve been treated with hostility as compared to, say, the Branch Davidians, but don’t you imagine that from the perspective of the insider, the past couple of weeks could be reasonably construed as “hostile”? As to immoral, I have to admit, well, yeah, we’ve got a good bit of that going on out here in the rest of the world. But if someone who is trying to legitimate marrying of 15 year old girls to 50 year old men is the one complaining about Desperate Housewives, I think the pot is commenting on the kettle….